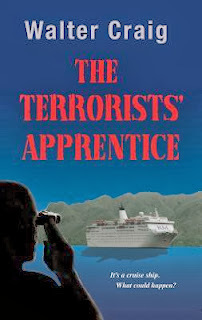 For a book with a rather unassuming cover and a somewhat generic blurb, The Terrorists' Apprentice proved to be a welcome surprise. It's very much a throwback to the big disaster books of the 70s and 80s, in terms of being a high-concept, high-stakes thriller, but it smartly does away with the bloated cast and soap opera pacing. Instead, Walter Craig puts just a half dozen or so key characters at the forefront, keeps their stories from becoming bogged down in drama, and never allows the pacing to stray far from the central story. There's a little bit of Crichton-esque science fiction here, involving the polymerization of non-carbon compounds (in this case, hydrogen peroxide), but otherwise the terrorist plot is as simple as it is ingenious. There are no complex conspiracies or double-crosses needed to ensure the plot's success, no convenient coincidences, and no forced suspension of disbelief. All Mansur has to do is get his detonator deep into the bowels of the ship, and the diesel tanks themselves will supply the fuel for the bomb. With years of planning, it's no stretch to accept that a willing accomplice can be inserted into the trusted crew, and Mansur's test voyages allow the reader to experience the natural evolution of his plan. In terms of characters, Craig has done a solid job here of creating a well-rounded, well-developed cast to put at the forefront. Mansur's development from an average man into a passionate terrorist is handled very well, with his doubts and missteps a large part of what make him an almost sympathetic sort of villain. His brother is far more the type of sociopath you might expect to be behind such a terrorist plot, but amoral opportunism makes for not just an interesting contrast to Mansur, but for some crucial familiar interactions. Mike, the LAPD offer forced into retirement, only to end up as a security officer on an Australian-Indonesian cruise ship is as close as Craig comes to playing the stock action-hero card. He's a good guy who doesn't play by the rules but, unlike his big screen counterparts, he has no problem with authority. He's not angry, bitter, or resentful of the way his career ended, just somebody looking to begin that next chapter. Yes, he's a bit more impulsive than most people would be in his situation, but you'd have a pretty boring story - and one with a rather sudden end - were it not for the hero. Sam, the vacationing divorcee nurse, is the only main character I thought the story could do without. She's fine as a character, likable and respectable, but she really just exists to force a romance into the story that didn't really need to be there. It's okay, because it works, but I don't think the story would have lacked anything for her absence. The pacing here is solid - patient and deliberate, but always moving forward - and the suspense is all the more effective for the way in which it builds. The roadblocks and challenges that arise to Mansur's plan are entirely natural, just as his means of overcoming them is completely believable. There is a bit of a twist epilogue that I'm still not too sure about - it's either a brilliant tying up of loose ends, or a cheesy capitulation to those old disaster books - but it doesn't take anything away from the most important climax. All-in-all, The Terrorists' Apprentice is a solid thriller with a good cast of characters. Definitely recommended. Well, I do enjoy reading Crichton, so will check it out.